The gentle patter of rain on the roof of a tent is a calming sound that lulls weary campers into deep and welcome sleep. Awaking to find oneself immersed in a small lake formed overnight by aforementioned seemingly gentle, but constant, rainfall is somewhat less appealing. Winter backpacking on the Olympic Peninsula can hardly be described as a comfortable or even pleasant experience, but when Cabin Fever descends during the interminably dull winter months that characterize Western Washington, an insane lust for adventure may seize the heart, and the mystery of the Olympic Rainforest offers ample opportunity to quench that desire. 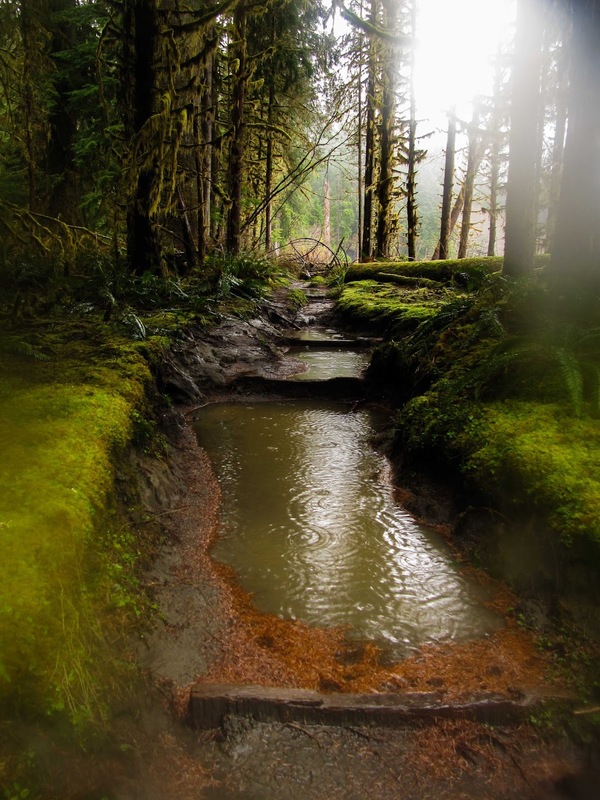 The Hoh Rainforest is located on the western side of the Olympic Peninsula, and its groves of old growth trees stand as sentinels to the fortress of towering peaks that make up the Olympic range behind it. 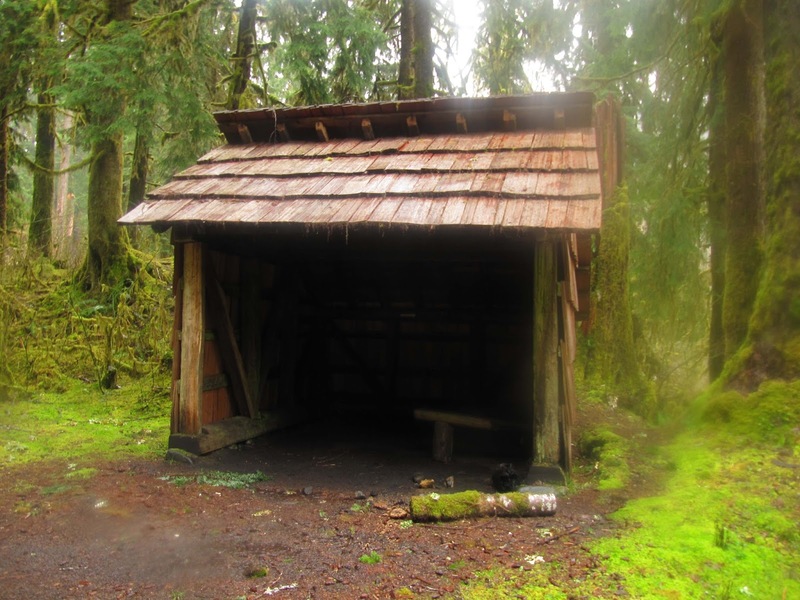 At the time I was a member of the Toutle Lake High School Hiking Club, and we wanted to take advantage of the three day President's Day weekend to hike the snow free lowland trail 10 miles up the Hoh River and camp near Olympus Guard station. We would then use that as a base for explorations further up the valley-perhaps even as far as the Blue Glacier! Of course it would be wet, but in our minds we imagined the sodden clouds lifting for at least part of our journey, allowing us to see those grand peaks which I had so floridly described to the club to entice them to go on the hike. As the week before the trip dragged on, we watched the forecast grow progressively grimmer. The predicted weather morphed from scattered showers to torrential rain. But our intrepid group would not be dissuaded; we convinced ourselves that we actually wanted to see the rainforest as it truly was! Anyway, we thought, how often do weatherman actually get it right? When Saturday finally arrived, it brought with it a bleak, leaden sky, but we assured ourselves that it couldn’t be grey everywhere in the State! It turned out that our assumption was correct: the clouds turned more of a bruised purple as we drove north and when we reached the trail head, the clouds themselves had been obscured by rain. 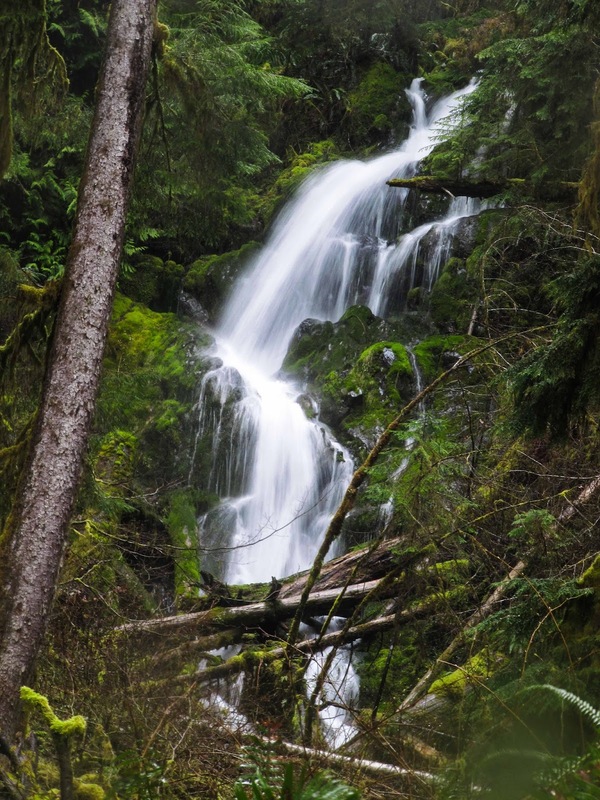 That day we experienced the true meaning of the word rainforest: The forest was alive with water, it roared over tall waterfalls tumbling from every hillside, and rivulets poured from every branch leaf. 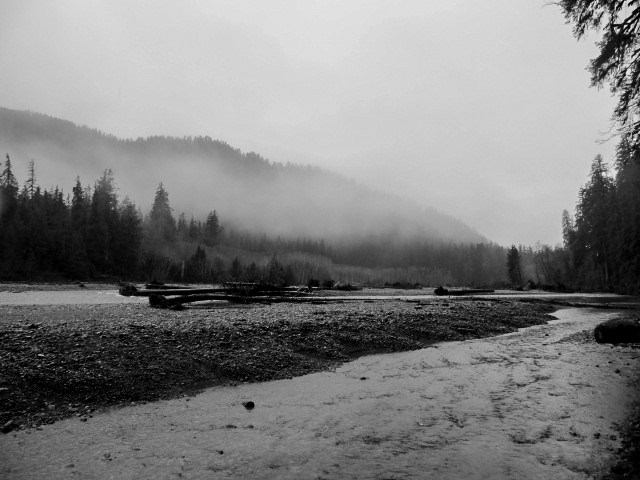 The Hoh River was a torrent of wild glacier-milk, the same color as the clouds above. I huddled beneath the scant protection of my umbrella as the rain cascaded from the rim. 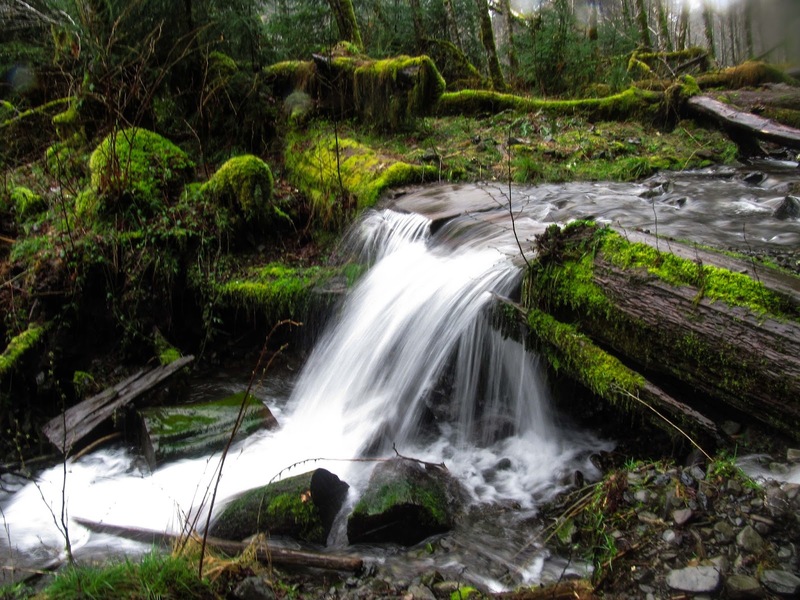 Enveloped in a liquid cocoon, I viewed the hike through a veil of falling water. Is it a trail or a creek? 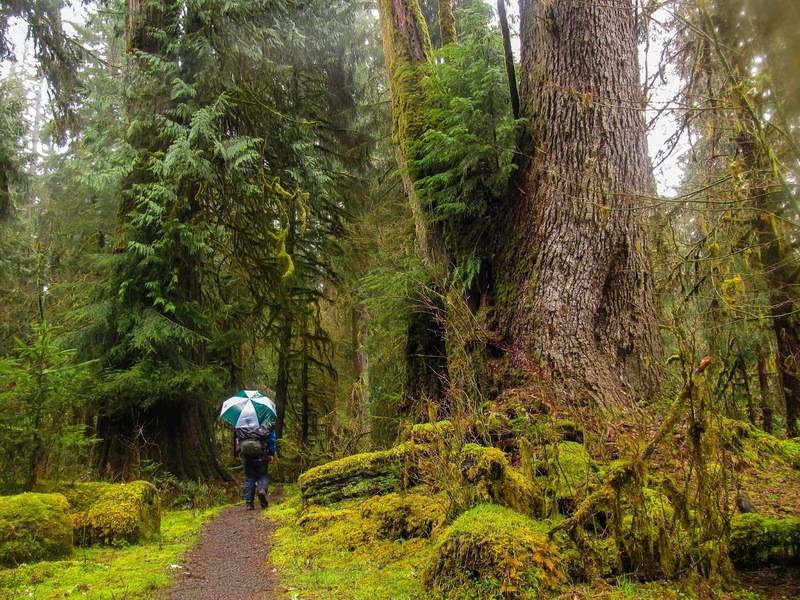 To step into the Hoh Rainforest is to enter another world. Everything is green, even in the heart of winter when all the leaves have fallen. Moss of every imaginable variety covers literally everything: stumps, trees, rocks- everything is covered by a velvety blanket of vivid emerald. I got the impression that if I was to rest too long, the moss might cover me as well! 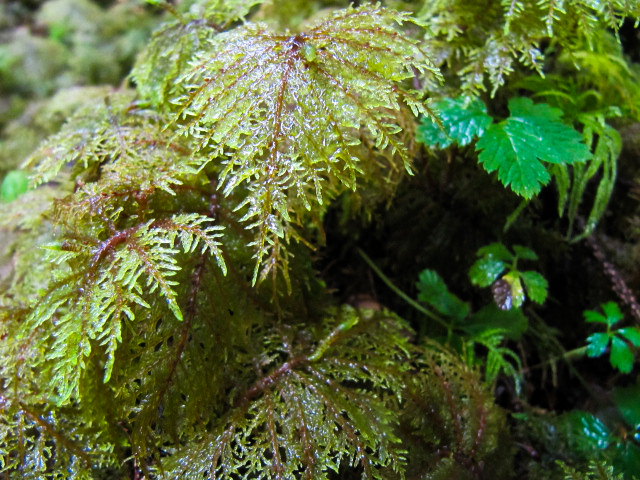 The torrents of water only magnified the splendor; crystalline rain drops sparkled from every frond. 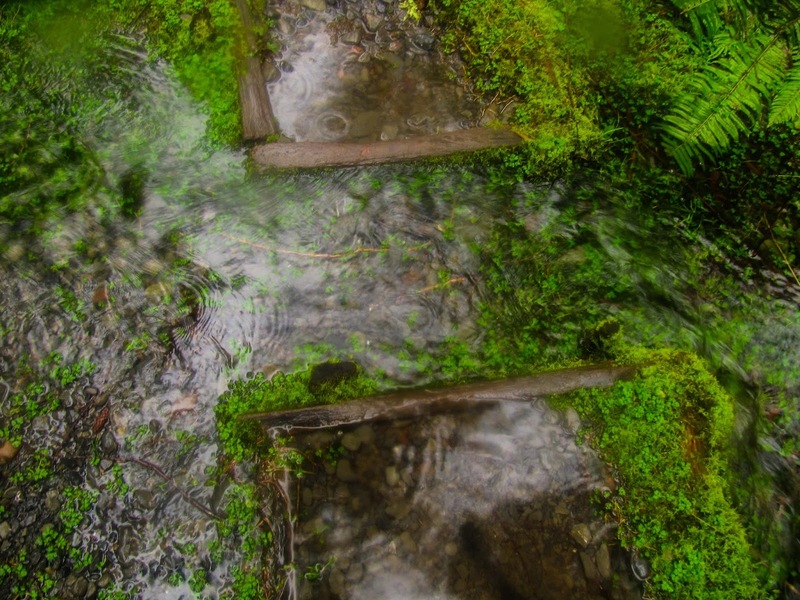 The moss even grew under the water, and so clear was the water that it appeared as though the moss was coated in liquid glass. 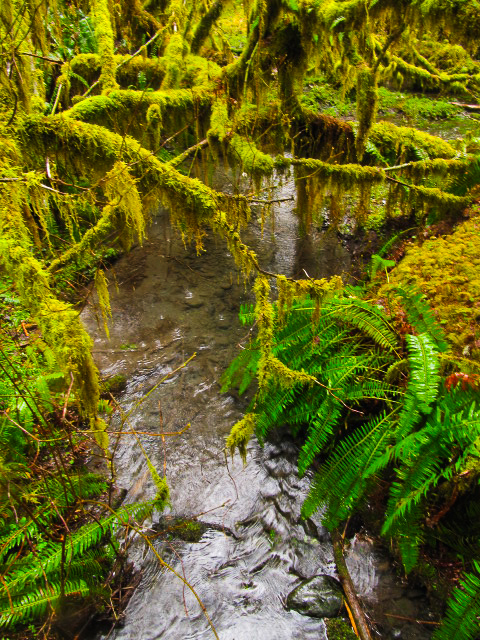 The fuzzy softness of the moss, the ethereal mists, and the tumbling rain give the forests of the Hoh a dreamlike quality. This surreal saunter through the rain-drenched wood eventually came to an end. Recent storms had brought down many trees, and at times it was necessary to deviate for as much as a hundred yards from the trail in order to bypass logjams of massive monarchs that had fallen like dominoes. After five miles of crawling over, around, and under downed trees in the pouring rain, we came upon the welcome sight of an Olympic Park shelter, known as the Happy Four Shelter. With squelching boots and drooping pants' legs, this seemed far better to stop here than to slog our way to the original destination. In our sodden, detour- weary condition, an easy five mile hike had felt like a forced march of 15. Several of us set up tents on the highest ground available, while the rest decided not to bother and spread their bags in the shelter. I, being an intrepid, gung-ho camper, wanted to test out my new tent in the rain, so I set up on what appeared to be high ground in front of the shelter. We had hoped to build a fire and dry off, but so wet was everything that all attempts failed and we were reduced to warming our clammy hands around the meager flame of our camp stove. It is difficult to imagine how miserable we might have been without the shelter, which was clean, dry and in remarkably good condition. It felt like a safe haven from the relentless onslaught of the deluge around us. Night fell, and the forest was plunged into pitch-black darkness, filled with mysterious drippings and the ever present roar of the river. Lulled by these noises and bone weary, I quickly fell asleep. I awoke to a damp feeling in my feet, and found, upon further investigation, that a small puddle that had lain twenty feet away from my tent had spread, and was now a small lake, the further shore of which could just barely be glimpsed by the meager beam of my head lamp. In fear of being flooded out and washed into the green oblivion of the rainforest, I somehow managed to uproot my tent and drag it and all my gear into the shelter and away from the ever spreading lakelet. Though I was now safely in side, the rest of the night passed uneasily; in my imagination, the rain would never stop. Soon the entire valley would be one massive torrent, and our meager shelter would be swept down out of the mountains right into the Pacific Ocean! Miraculously, dawn found us safe on land, and we were able to pack our tents away inside our small haven without getting totally soaked. No one had any dry clothes left, and there was little enthusiasm for continuing our adventure. The group of shuffling, dripping vagabonds who returned to the trailhead bore little resemblance to the chipper hikers who had departed only a day earlier. Fortunately, I had stashed a dry set of clothes under the seat of the car, and never had a change of clothing felt so good. You would think that such an experience would put those involved off the idea of winter camping, and for the majority of the group that might be true. However, my brain has the remarkable ability to gloss over a few unpleasant details, and I found that I was once again planning theoretical rainforest expeditions. I could no longer remember the misery of the watery slog, but recalled mysterious visions of a fantastically green country where Ents and leprechauns might dwell. I came away feeling that I had been on adventure that few people are ever lucky enough to encounter, and it made me thirst for more. The problem now is finding anyone naïve enough to accompany me…..
Love your descriptions, Andy! You make me think camping in the rain could actually be wonderful!